If your old mattress is starting to get between you and your best self, maybe it’s time for a change. While the Better Sleep Council recommends changing your mattress every 7-10 years, it really depends on how often you use it and care for it. If your sleep is beginning to suffer or you’ve begun to outgrow your full-sized bed, it may be time to check out other options. While shopping online for your next mattress couldn’t be more convenient, nothing beats getting to lay down and physically testing your options to avoid any pains. Here are some tips and tricks to help you begin your search. The spring mattress is the more traditional mattress, and the demand for this particular type has decreased over time making it one of the most affordable models. As one of the most durable mattress models, it is known to last longer than the average mattress lifespan. This type of mattress is great for sleepers who look for the traditional bounce, cooling, and strong support. 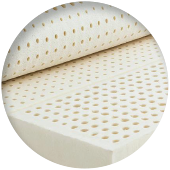 Latex mattresses are for the consumer who looks for a good bounce, cooling capabilities, and responsiveness. There are two types of latex mattresses: natural and synthetic. Natural is more environmentally-friendly while synthetic is a combination of synthetic polymers and natural trees. 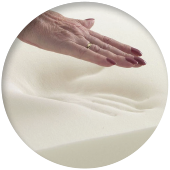 Memory foam mattresses contour to the body of each user, providing pressure relief and support. Laying on this mattress almost feels like a supportive hug. Newer models have focused on providing this mattress with greater cooling qualities. This mattress is perfect for sleeping with a partner because the motion is not transferred to the other side of the bed. If you have a restless partner or either of you are light sleepers, memory foam is a perfect option for couples to get a good night’s sleep. 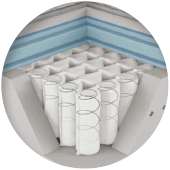 The hybrid mattress is a combination of the spring and the memory foam types. The optimal model of this mattress is one that has 3 inches of foam. This model is quite the investment, but a worthy one that gives you the support of spring mattresses and the luxury of memory foam. Everyone sleeps differently! The mattress that your friend raves about doesn’t mean it’s going to work for you. 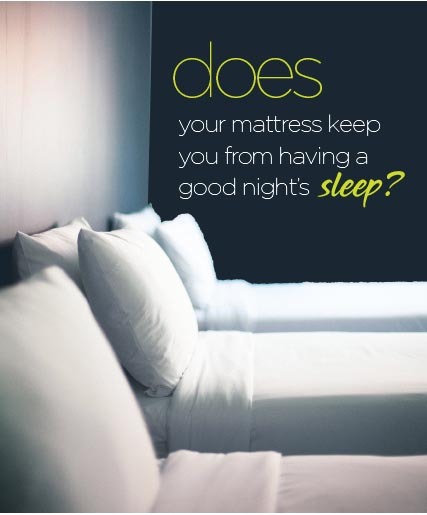 Make sure when you’re shopping mattresses, you keep your nightly habits in mind. Side sleepers toss and turn all night whether it’s their whole body or maybe just their legs. Due to their constant rotation, a soft to medium firmness level is perfect for these sleepers. If a mattress is too firm, this could lead to neck, back, and shoulder pain. For that sleeper that enjoys spinal alignment, a firm, supportive mattress is crucial. The Better Sleep Council records that about 15% of people sleep on their backs. 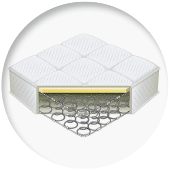 Memory foam mattresses are ideal for spine contouring while providing structure. The torso applies a lot of pressure, therefore a stomach sleeper has to prioritize support. If the mattress is too soft, it could cause a curving of the spine. The mattress has to be flat, firm, and supportive for this sleeper. Luckily, most mattress options are medium to medium firm. Ultimately, remember that when choosing a mattress, you will have to pay for quality. For this purchase, resist turning to the cheapest option because your health and sleep are important. To make your dreams even sweeter, check out alternatives to traditional financing. The TEMPOE no credit required leasing program, with monthly or biweekly payments and early purchase options‡, will help you afford the quality rest you need. Find a store near you or apply on the TEMPOE website today. The TEMPOE no credit required lease program offers a simple application, fast approvals, flexible biweekly or monthly payments, and early purchase options‡ in most states. The program has a 5-month minimum term, then you decide what happens next: purchase the items†, continue leasing, or return items to TEMPOE. The Obvious Choice Leasing Solution, TEMPOE serves a broad market throughout the U.S., Guam, Puerto Rico, and the U.S. Virgin Islands. Click here to apply today and find a retailer near you.